Those of you who remember the brash 90s version of the WildStorm universe (or even its noughties iteration) might well be rather bemused with Warren Ellis’ character-driven intrigue-heavy take on it so far. Up to now, we’ve had two issues in which, while there has been some incident (the most important being Angie ‘Engineer’ Spica saving Jacob ‘Emp’ Marlowe’s life), much of the panel space has been devoted to groups of people sitting around talking to one another, all presented rather beautifully in John Davis-Hunt’s immaculate art. Well, if you were worried that this series was going to become a cerebral, over-talkative snoozefest (albeit a smartly scripted one), you can breathe a sigh of relief. All that talking was necessary to give this issue’s action context and emotional impact. And, dammit, it is good. The issue opens with the kind of sequence that reminds you just how good a writer Warren Ellis is. 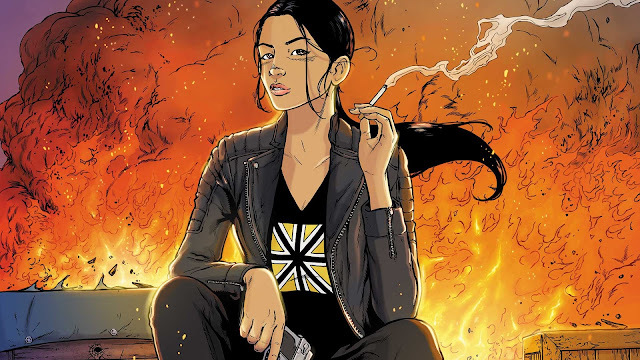 In IO’s headquarters, important people are talking about the developments of the last couple of issues, while a rather attractive young Asian woman, whose casual dress comes complete with a tastefully understated union jack tee-shirt, moves from screen to screen taking in the conversation as she goes. All the while, the IO employees are completely oblivious to her presence. As a way of introducing readers to a new character while reminding readers of the ongoing fall-out from the last two issues, it’s both economical storytelling and wildly imaginative. Not only that, but Ellis uses this opening as a way to tie the book into the (or at least a) wider DC Universe with references to Commander Steel, Martian Manhunter and Ted Kord before showing us the enigmatic young lady back in her apartment. It is here that she has a notice board on which post-it notes with the names of the major players we’ve encountered so far are stuck with thread linking them to each other and additional notes with things like “Hyperstitional Warfare”, “Nine Treaties” and “Human Property Schism” written on them. 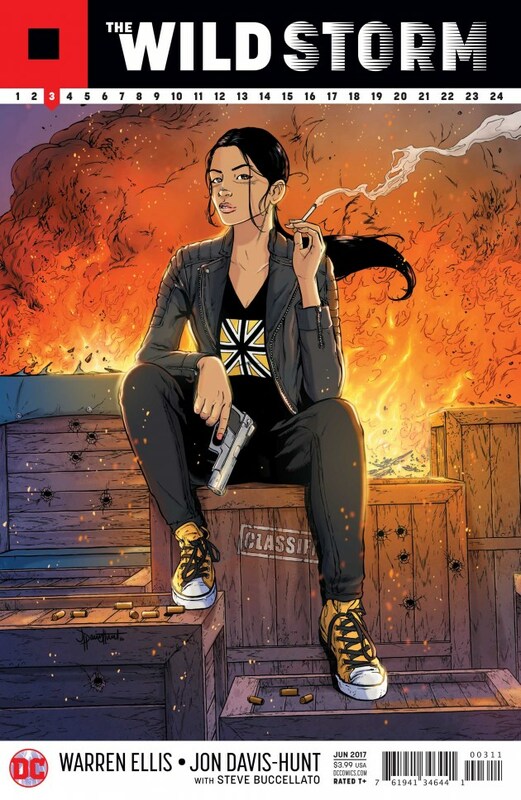 The cigarette lighter engraved with the words "Mars Expedition 1955" suggests that this is Jenny Quantum, descendant of former Stormwatch and Authority member Jenny Sparks, and one of the Wildstorm universe's so-called Century Babies. Then we’re back to Angie who’s holed up in her disused IO facility, perfecting her flight equipment, when she’s visited by our rogue three-person CAT (Covert Action Team) of Void, Grifter and Kenesha who complete the teleportation they began last issue. They start a conversation with Angie but are rudely interrupted by the IO CAT we saw Miles Craven deploy last issue, too. Things kick off. Look, if you’ve been a comic fan for any length of time, you’ve seen this kind of thing hundreds – if not thousands – of times before. A team of bad guys take on a team of good guys while the big bad guy watches remotely from somewhere far away. This is done so very well, though. For one thing, there’s no posturing or trash-talking. There is just an exchange of fire between two highly professional groups of killers, rendered beautifully by an artist who is at the very top of his game. Important details are shown without interrupting the ongoing flow of the fight. Craven’s commentary draws attention to one or two of these details, but these brief interruptions reinforce the sense of excitement and tension rather than disrupting it. In short, this fight is well worth the two and a half issues we’ve been made to wait for it. Ellis absolutely knows what he’s doing here. And, to top it all off, there’s a gut-wrenching development at the end (which I won’t spoil) that suggests that not all the characters Ellis has introduced us to are destined to last the full twenty-four issues. The sense of jeopardy in that final page is powerful and I’m rather miffed I’m going to have to wait another month to find out what happens next. All of which indicates a very assured, accomplished bit of writing. This issue was a remarkably quick read, particularly in comparison to its wordier predecessors. That is not to say, though, that the story is in any way slight or superficial. The art is not just beautiful (although it most assuredly is that); it is an integral part of the storytelling – important details are highlighted clearly and faces are both consistently and pleasingly expressive. In terms of pacing and development, the Ellis’ plotting is spot on; his dialogue is naturalistic but never superfluous. To be blunt about it, this is comic book storytelling right out of the top drawer. Lately, I’ve been re-reading Ellis’ initial run on StormWatch and, as good as that is, this blows it away. The Wild Storm is engrossingly mature – both in its portrayal of super-powered characters and the moral universe they inhabit. If that at all sounds like it might be your thing – or you have even a passing interest in the fate of characters you may have enjoyed a couple of decades ago – this book is a must-buy. It is effortlessly involving, dramatic, witty and intriguing stuff. The woman being down on the ground with glass in her face just completely fucked me up for some reason. Something with it not being overly gruesome or the fact that she looks like she's lying there crying, I don't know what it was about it but it completely disturbed the hell out of me.